Our house has a verandah around to catch the sun all day. You can Bar-be-que on the front deck with stunning views over Frederick Henry Bay to Mount Wellington above Hobart and across the Norfolk Bay towards Port Arthur. For a warm cosy atmosphere there's a free standing wood heater in the spacious open plan living area. The bright kitchen with window skylights has a gas stove and lots of appliances. There is a queen bed in the main double beds second bedroom and a single with trundle in the third. Bathroom has shower and bath tub, the toilet is separate. Rumpus room has 51" Plasma and Wii with assorted games, laundry, extra toilet downstairs and another BBQ area. Magnificent views from kitchen, lounge and deck. Open plan living seats six. Wii and various games in the rumpus room. It wasn't hard to enjoy our stay here at Primose Sands. A country drive in from the main road and then to the peninsula where all you can see is the ocean! The house is clean and welcoming and the kitchen is well stocked. Comfortable beds too! Thank you Debbie and Brett. Wonderful location, fantastic facilities, nice and comfortable fireplace and a lot of wood for you to experience natural heating, although there is a aircon, we haven’t use the air conditioning. No regret at all, we will come back here soon. Thank you Dinoop, love having guests like you. Left our place just as you found it. Welcome back. 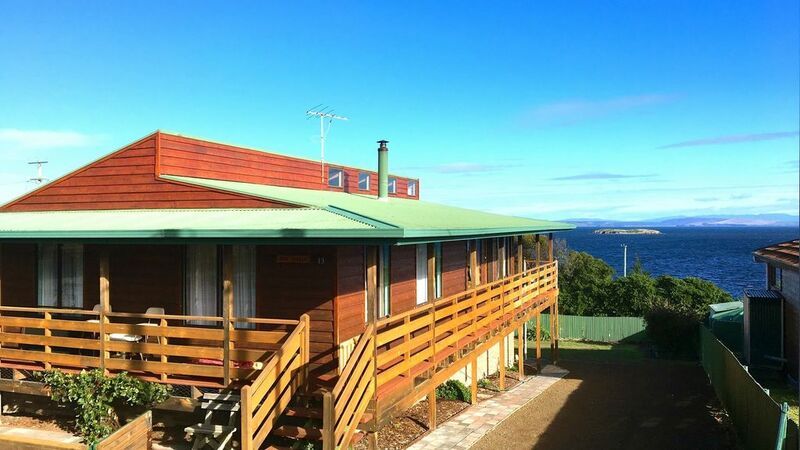 Stunning view, superhost, neat and tiday, close to Hobart. Great comfy home with wonderful views. We enjoyed our stay. Very spacious,great views and wood fire great to come back to at the end of the day of touring. Would definately stay again. A warm and cosy place with room for everyone. Sitting out on the deck taking in a breath taking view day or night with the quiet peacful surroundings setting the back drop perfectly.. nice big and open plan living area with a huge rumpus and get away for the kids set up to entertain fir hours. Spotlessly clean and well maintained and cared for house would definately recommend to stay and will definitely be back when next in the area. Enjoy a short stroll to the beach and corner store with takeaway food and a 3 min drive to the boat ramp. Within walking distance is the RSL club where you can relax for a cold drink and on Friday, Saturday nights and Sunday lunch have a counter meal. The house is aprox 45 mins from Hobart CBD and 25 mins from the airport. Only a short distance drive to the historic town of Richmond, wineries, restaurants and the Port Arthur historic site. The fishing town of Dunnalley (10 mins via the back road) has a 9 hole golf course, a beautiful pub on the water front for great meals and a fresh fish market with oysters straight from the farm or you can arrange for a fishing trip. Don't miss the Tasman Arch, Blowhole, Devils Kitchen, Remarkable Cave, Tessellated pavement and the Tasmanian Devil park. What about an eco-cruise or a wilderness and wildlife tour. For the adventurous there's plenty of rock climbing spots. Primrose Sands is a small beachside community with a general store providing essentials, takeaway food (great pizza) and fuel. Grocery shopping is preferred at Sorell (Woolworths or Coles) on your way from the airport.